The controller features 1 CAN port for controlling the outputs and diagnostics over the CAN bus. It accepts a nominal input power supply voltage of 9…60Vdc. Using the CAN network, it can provide control of up to ten outputs, configured for a wide variety of responses and up to 2.5A per channel (max 7A per module). For example, it can drive proportional valves, on/off valves or provide a hotshot control profile. PWM signal or proportional voltage outputs are also user selectable. Standard software is provided. The sophisticated microprocessor can accommodate complex application-specific control algorithms for advanced machine control on request. 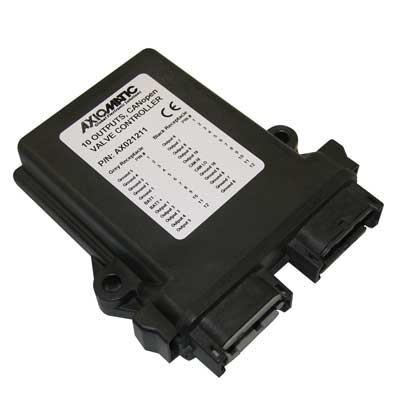 Rugged packaging and power supply surge protection suits the harsh environment of mobile equipment with on-board battery power. Settings are user configurable via standard CANopen tools. Output Type: The user can select between the following output types. Control logic: Standard embedded software.